Whatever prayers you've been sending to the late night TV gods, they're working, because Jon Stewart will return to television with Stephen Colbert, and all is not lost. There have been many times in the past few months when I've despaired about the state of our country, and about what will happen in November. But if anyone can get my optimism pumped back up again, it's this combination of humans. 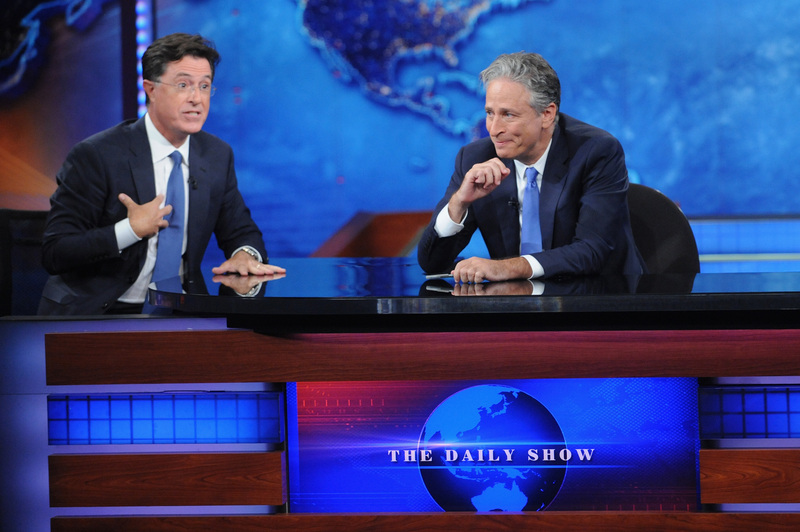 As we all know, there's been a Stewart-sized hole in political comedy since he left The Daily Show in August 2015, and with Colbert departing Comedy Central to helm The Late Show, our lives have been sadly devoid of his particular brand of satire as well. But now, finally, we're about to get to scratch that itch again, as Stewart will be joining Colbert for The Late Show's Republican National Convention coverage beginning on Jul. 18. Sigh of relief, everybody. It isn't clear yet what Stewart's role will be on the broadcast, or whether he'll remain for the full two weeks of planned live editions or just do a one-off, but, either way, I couldn't be more relieved to have him back in the game. What we all need right now is a good shake, either to wake us up to the consequences of inaction that could be coming our way — please register to vote, you guys — or to give us some hope that our fate isn't sealed, and Colbert and Stewart are just the duo to deliver it. They're two of the best, smartest, and most incisive minds in the business, if you ask me, and Stewart in particular has gained the trust of many after over a decade on television, so I have my fingers crossed that he can put things in perspective for us. It's a scary time, but I feel reassured knowing that Colbert and Stewart have our backs, and that their razor-sharp intellects are on the job again. Stewart's measured yet passionate takes on issues from race, to feminism, to political corruption and beyond have always been a beacon of hope guiding us forward, when we feel mired in ignorance and terror. His coverage of Ferguson and Benghazi in particular helped me at a time when not much else could or did. Ugh. The dude is so smart, and he cares so much, this is what I've been missing. I really can't overstate how much I feel like Stewart in particular is a light in the darkness, so the fact that he's teaming back up with Stephen Colbert is hugely important. Thank you for swooping in to our aid, you be-caped political superheroes. Now please never leave me again so I don't have to manufacture some sort of Parent Trap-like plot to keep you together.